It is said by historians that Byreford is a land that cannot be conquered. Throughout its recorded history, the province of Byreford has never been successfully and totally annexed by any one nation. This is not due to lack of interest. Byreford is a rich and fertile land, strategically situated and possessing two safe harbours. And yet the province remains home to the dispossessed, the misfits of larger societies. It seems fated to forever remain a divided frontier, never home to one nation but to many. Byreford is the first zone of Citadel we plan to make available to players. While it may be a small fragment of the larger world we have designed, and one designed for lower-level players, it is still a richly-detailed place full of dangers, intrigues and mysteries. Formerly a sleepy backwater, sandwiched between the enduring kingdoms of Creminster to the north and the vast and sinister Thornwood to the south, Byreford has experienced a strange reversal of fortunes in the last few years. Due to the interests of the merchant princes of Auldport, the small fishing village of Creadesly has sprung into a fully-fledged port town. It wasn’t always this way. 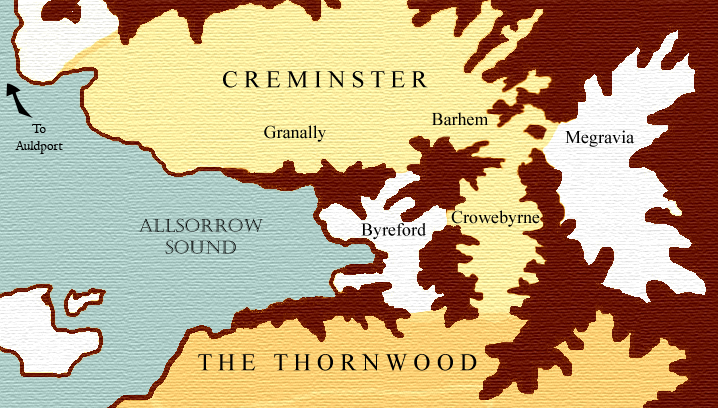 A century ago, Byreford was home mostly to poor settlers from two different kingdoms of the Creminster nation, Granally to the North and Crowebyrne to the East. The province was considered too resource-poor for either kingdom to take great interest in it. At the time, the Thornwood was a distant concern, dozens of miles to the South of the province’s Southmost border. Then the outbreak of the Second Ravening War changed Byreford’s significance forever. The war began when the man-eating giants of the colossal valley of Megravia broke through the ancient defences which hemmed them into their home territory. Under a fearsome leader, the giants ravaged the kingdoms of Creminster, laying seige first to Barhem, then breaking through to Crowebyrne and Granally. At first, Crowbyrne repelled their assault, but by taking the undefended lands of Byreford, they were able to launch a twin-pronged assault on Crowebyrne’s north and west borders. Hadrin Castor was the Creminster general who, abandoning his post in Auldport (at the time a colony of Creminster), launched a desperate flanking assault on the giants’ Byreford forces. Due to a combination of cunning, courage and luck, he was able to prevail, saving Crowebyrne from a Westerly invasion. Unfortunately, the giants on the northern front were still able to flood through and lay waste to the kingdom. Today, Castor is considered a hero, albeit a tragic one, by Auldport and the common peoples of Byreford. He is incidentally considered a traitor by Creminster who blame him for the loss of Auldport. It is no coincidence that the first locale players will visit in the game is called Castor’s Landing. In modern times, Byreford has fallen partially under the control of the merchant houses, due to a controversial arrangement in which Auldport has leased the province from Creminster (though it is disputed as to whether it was theirs to lease in the first place). Increased trade from the Thornwood along with the flood of resources from the embattled “Creadesly Project” has caused an economic boom in the province. Creadesly is now a bustling port, and even its sister village of Bellroy has seen increased fortune. Of particular interest here is the Creadesly Project itself, which is an Auldport initiative centered around the taming and domestication of giants. Needless to say, this initiative is not regarded by all to be a good thing, particularly by those who remember (or claim to remember) the Megravian Wars. On more than one occasion, a rogue giant escapes from the project and pillages the countryside, giving the project an even worse reputation. Also, with increased fortune comes increased depredation. Bandits, pirates, swindlers, highwaymen and all manner of unsavoury types have flocked to the province, hoping to carve a slice of the commerce for themselves. This on top of the threats that existed before, such as the crazed burrow-folk, the ever-present menace of the otherworldly Jinn and other creeping, clawed threats. It is a place of danger, but also one of great rewards for those brave enough to take up a sword or musket. Citadel’s journeying game system is designed with maximum flexibility in mind, for seamless travel through a large world. 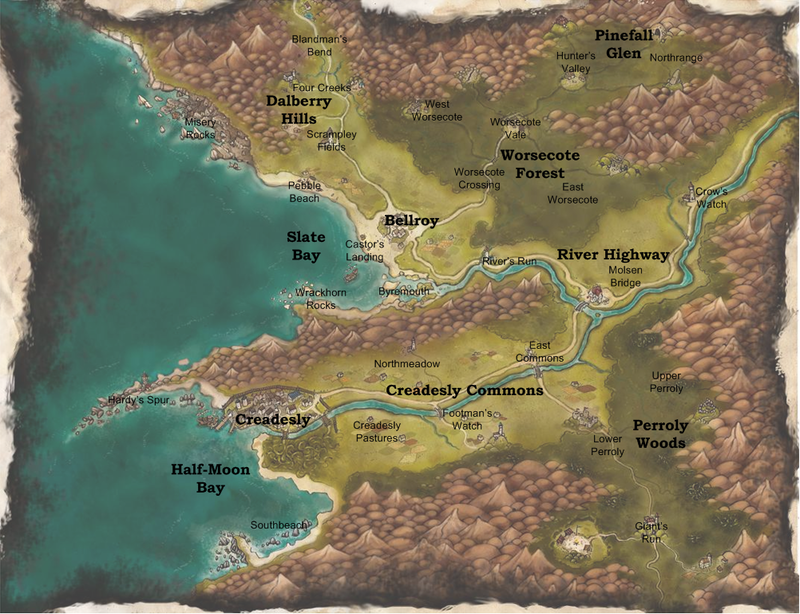 Though Citadel is a largely text-based game, full-colour maps will guide you along your way whether you are traveling by land, road, sea or even air. To get from one place to another in citadel, you simply say where you want to go and you will auto-travel there via the most expedient means available to you. Because our world is large and travel can potentially take a long time, we wanted players to be able to journey mostly on “auto-pilot”. This means you can start travelling and go do something else. We do try to provide a lot for you to do while travelling, such as inventory management, chatting, planning crafting projects and even browsing local markets if you have the correct skills. If you are paying attention to the journey, however, there are also rewards to be had. Wilderness encounters appear while you travel, and you may take advantage of harvestable resources, enemies to attack and even quest-starting opportunities. Of course, in more dangerous areas, it is not advisable to journey away-from-keyboard as wilderness encounters can sometimes take advantage of you! Well, that’s it for this week. I hope this has given you at least a taste of the world of Citadel. Next week, we’ll have a look at another one of our starting classes, the mystical and musical Chanter, and in doing so we’ll be having a look at the Chorist religion of Citadel. See you then!